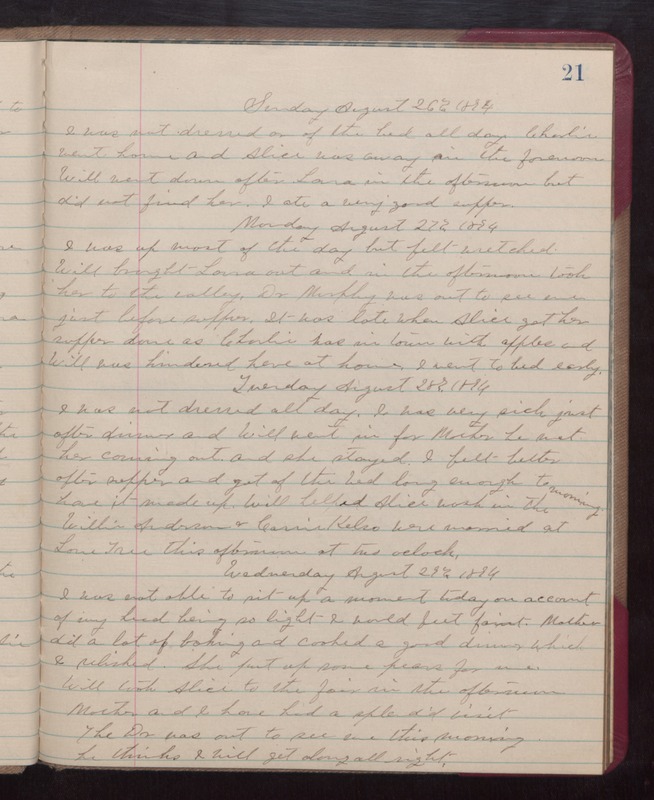 Sunday August 26th 1894 I was not dressed or of the bed all day. Charlie went home and Alice was away in the forenoon. Will went down after Laura in the afternoon but did not find her. I ate a very good supper. Monday August 27th 1894 I was up most of the day but felt wretched. Will brought Laura out and in the afternoon took her to the valley. Dr. Murphy was out to see me just before supper. It was late when Alice got her supper done as Charlie was in town with apples and Will was hindered here at home. I went to bed early. Tuesday August 28th 1894 I was not dressed all day. I was very sick just after dinner and Will went in for Mother he met her coming out and she stayed. I felt better after supper and got of the bed long enough to have it made up. Will helped Alice wash in the morning. Willie Anderson and Carrie Kelso were married at Lone Tree this afternoon at two oclock. Wednesday August 29th 1894. I was not able to sit up a moment today on account of my head being so light I would feel faint. Mother did a lot of baking and cooked a good dinner which I relished. She put up some peas for me. Will took Alice to the fair in the afternoon. Mother and I have had a splendid visit. The Dr was out to see me this morning. he thinks I will get along all right.